CT without contrast (not shown) showed a 2-cm right parietal hypodense lesion with surrounding edema. Magnetic resonance imaging (MRI) was performed using a GE Signa LX 1.5T MRI scanner and magnevist was injected intravenously (0.1 mmol/kg body weight).It showed several enhancing lesions in the right parietal lobe, and the large, main mass showed rim-enhancement (Figure 1). Diffusion-weighted (DW) imaging was performed with an axial single-shot echoplanar sequences (TR/TE, 10000/99, section thickness = 5 mm, FOV= 38 cm) with an apparent diffusion coefficient (ADC) map image, and a demonstrated heterogeneous but relatively isointense mass to the unaffected white matter on DW imaging, with a corresponding ADC map-image showing an iso/hyperintense mass with surrounding vasogenic edema (Figure 2). In the AIDS population, differentiation of cerebral toxoplasmosis and lymphoma can be a challenging clinical and radiological problem. These lesions are two of the most common focal brain lesions in patients with AIDS, and they typically occur when patients are severely immunocompromised. At presentation, symptoms and signs of neurologic disease in HIV-positive patients are frequently nonspecific. 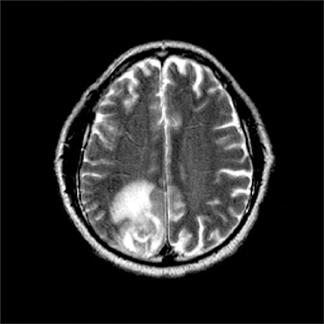 In radiologic terms, either disease can present as a single mass or as multiple lesions that show ring-shaped contrast enhancement on CT and MR images.2 Also, the two diseases occasionally have been documented to coexist, which further complicates diagnosis.3 Accurate and early diagnosis is important because the treatment and prognosis for these diseases are so different. Because of this diagnostic dilemma, other radiologic techniques have been suggested as a means of distinguishing between the two conditions. 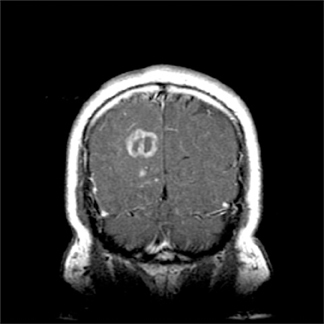 Toxoplasmosis lesions are most commonly located in the cerebral hemispheric white matter and subcortical gray matter, such as the thalamus and basal ganglia, and CT and MR images show multiple ring-enhancing lesions.4 A focal enhancing mass with subependymal spread on CT or MR images and hyperattenuation on nonenhanced CT are features which favor the diagnosis of primary CNS lymphoma.5 Recently diffusion-weighted MR imaging with ADC maps has been used as a tool for characterizing infectious and neoplastic brain lesions.Unlike pyogenic abscesses, the core tissue of rim-enhancing toxoplasma abscesses shows no restriction of water diffusion, and the signal intensity of the abscess core on diffusion-weighted MRI is equal to or less than that of normal, unaffected cerebral white matter. In addition, the measured apparent diffusion coefficient is greater than that of unaffected white matter.6 Some investigators also demonstrated that toxoplasmosis lesions show significantly greater diffusion than that of lymphoma lesions, and ADC ratios > 1.6 were associated solely with toxoplasmosis7. At most centers, however, the current clinical policy for AIDS patients with intracranial mass lesions is a therapeutic trial with antitoxoplasmosis chemotherapy for 2 to 3 weeks. Fortunately, the median time to neurologic response is 5 days, with a significant improvement present in > 90% of patients by day 14.4 If there is no clinical or radiologic response to the treatment at this stage, biopsy is considered. Porter, SB, Sande, MA. 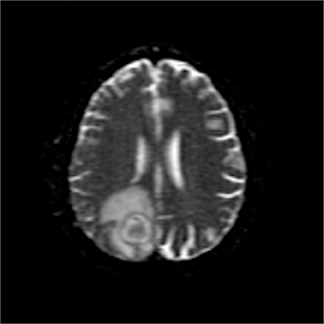 Toxoplasmosis of the central nervous system in the acquired immunodeficiency syndrome. N Engl J Med. 1992; 327: 1643-1648. Ernst TM, Chang L, Witt MD, et al. 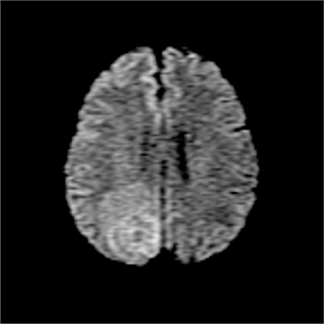 Cerebral toxoplasmosis and lymphoma in AIDS: perfusion MR imaging experience in 13 patients. Radiology. 1998; 208:663-669. Rodesch G, Parizel PM, Farber CM, et al. Nervous system manifestations and neuroradiologic findings in acquired immunodeficiency syndrome (AIDS). Neuroradiology. 1989; 31: 33-39. Ramsey RG, Geremia GK. CNS complications of AIDS: CT and MR findings. Am J Roentgenol. 1988; 151:449-454. Dina TS. Primary central nervous system lymphoma versus toxoplasmosis in AIDS. Radiology. 1991; 179: 823-828. 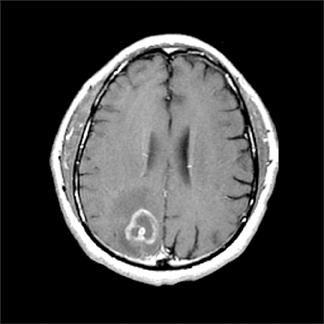 Chong-Han CH, Cortez C, Tung GA. Diffusion-weighted MRI of cerebral toxoplasma abscess. Am J Roentgenol. 2003; 181:1711-1714. Camacho DLA, Smith JK, Castillo M. Differentiation of toxoplasmosis and lymphoma in AIDS patients by using apparent diffusion coefficients. Am J Neuroradiol. 2003; 24: 633-637.